If there’s one thing I’ve learned about life it is that nothing is certain. Children grow, and with each new phase of their life our schedules change, our routines, change and as moms we’re often left scrambling and feeling like we can’t keep up. This is where I’ve been the past few weeks. We’ve come to the point now where each person has their own schedule. I know it sounds like my kids are teenagers, but in reality one just started 1st grade and one starts Kindergarten next week. My husband works 3 rotating shifts. My 1st grader goes to school in the morning one week and in the afternoon the next. My kindergartener has kindergarten two days a week right smack in the middle of late morning. I am the one who has to make sure all of these gears are in proper working order, or the whole thing could just blow to kingdom come. The thing is this: I am a chronic schedule maker. I feel very secure when I know that certain things happen at certain times and in certain ways. But that part of my life is on hold…..indefinitely. Depending on which weeks my husband works, our meals change because he’s not home for dinner. Depending on which weeks my son is in afternoon, our meals change because he’s not home for dinner. And there is Kindergarten run. And there are walks to the bus stop and back. And yet in the midst of this craziness, I feel it is important that my boys still do chores, that we have family devotions, and that we have time together to play games and chat and have fun as a family. Because there are some things that should never change. Maybe we don’t have guaranteed meals together, so family time is essential now. In the midst of all of this craziness and my attempt to be the grease in the gears of our family schedule, I have had moments of panic, stress, and wondering if I we can do this. And then comes along this new Good Morning Girls study — it’s like God wanted it made just for me. If you’ve followed Good Morning Girls for a while, you know that we’ve been in an extended break. During this break, God was teaching Courtney some important truths that we all need in our life — when we walk through grief, when we endure tragedy, when we have a huge setback, or are just stressed out to the max. During the month of October, I will be blogging through the the Rest and Release study. Each Friday I will post my thoughts on what we we’ve been studying. There are so signups. All you need to do is grab the journal here, and then if you’d like to join a private Facebook group, I invite you to join mine. You can find us by clicking here. 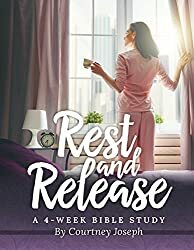 Let’s learn to rest in Jesus and release our burdens to Him. May I ask why your children’s schedules are so odd? Is that normal for where you live or do they have different schedules than most? Here (Ontario, Canada) Kindergarten is all day every day and so is all the other grades. My oldest’s 1st grade schedule is normal for here, but no one can figure out why on earth they decided kindergarten should be from 11-3. But it is normal here for them to attend only a couple times a week. I wish it were everyday, because I think it would be good for them….so I am homeschooling on the opposite days.